The sun has been making an appearance in Portland lately and the daffodils and cherry blossoms are starting to bloom and today is officially spring! That means it is about time that I start really planning out my garden for the next few months of spring and summer planting. I can't wait to get back in the garden and start grilling up fresh veggies from the yard! 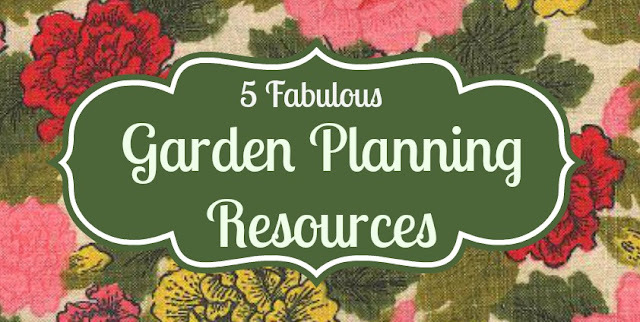 Before all that can happen, there is a lot of planning, so I figured today would be a perfect day to share 5 of my very favorite tools and resources to plan my garden. The plan for this spring/summer! 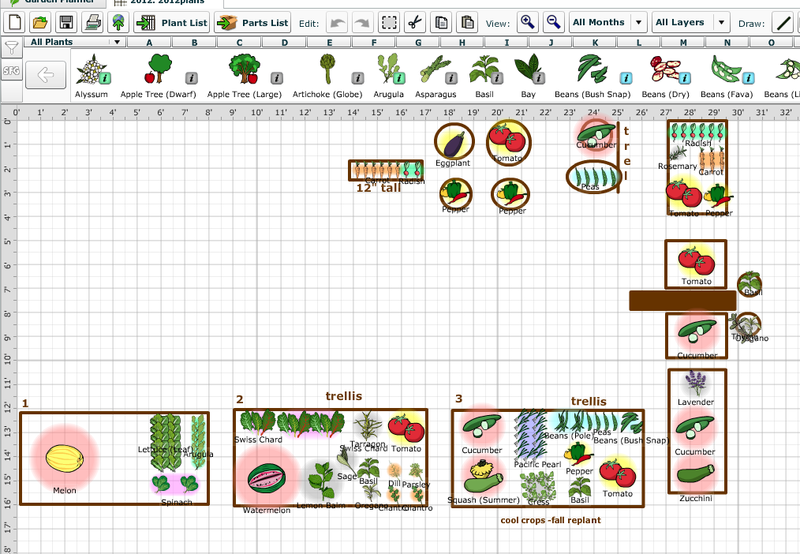 I like to do my planning using a neat tool a found last year called growveg. It's a really neat tool that helps you set up your perfect garden by putting in the measurements of each of your beds or containers and aligning them however you'd like. Then, you simply choose the plant you would like to put in the garden and it automatically shows you how much space that particular plant needs. It really takes the geometry and guesswork out of garden and creates a a very visual guide for your garden. I also like that it lets you save your plans form year to year and offers crop rotation ideas, has the option of sending you email reminders for planting, and that each plant has helpful growing information right on the application. It has been a really helpful tool for me. 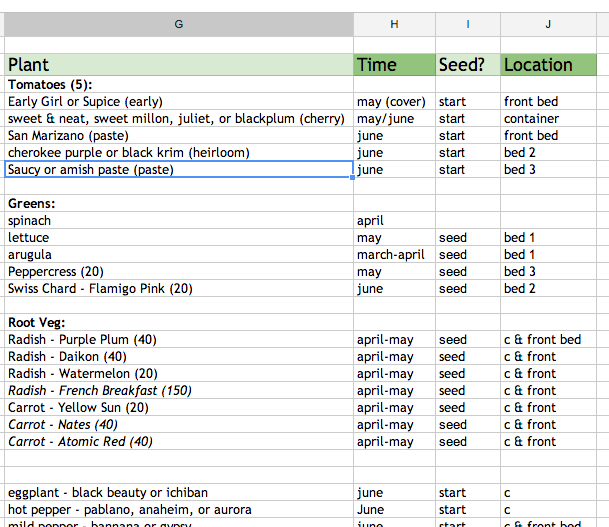 Not exactly made for gardening, but spreadsheets and I are BFFs. 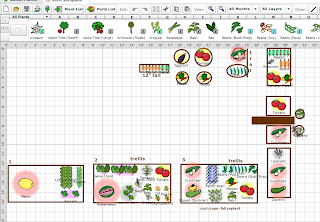 I like to create a spreadsheet to go with my plan so that I can do research and decide on the varieties I want to plant and then transform it into a to do list or mark off what I have already planted. I really like GoogleDrive for simple sheets like this because it is so easy to access and update on my phone while I am out shopping. 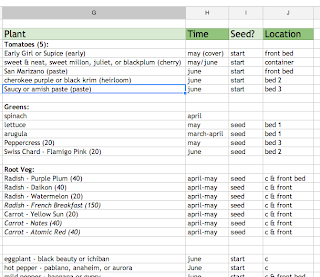 I keep a pretty simple list of all the things I want to plant and which varieties (I say this is simple, but I am a nerd and do a ton of research to pick each variety), then I research and fill in the planting dates for each plant (see below), note if I plan to do seeds or starts, and the location that I will be planting it. Once you have all the information in place, you can sort your plants any way you want. I like that I can quickly sort by date and get a perfectly tailored calendar of "to do" lists for each month. To do this sort in GoogleDrive: select all of your columns and rows with data, left click & select "sort range", in the drop down called "sort by" select the column that has your dates in it, and click ok. Presto! 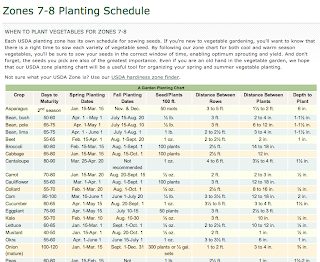 A garden planting schedule is crucial to making sure you have healthy plants. 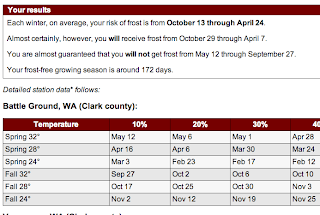 If you put them in too soon, they could die in the frost or have stunted growth, too late and they might not have time to produce. 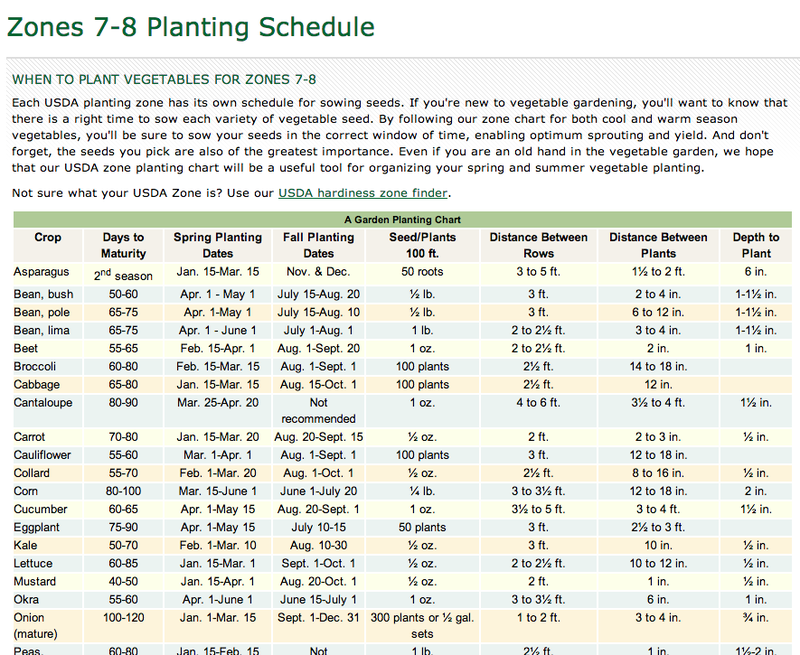 The Vegetable Garden website has a great chart for all of the zones in the US. You can also often find a chart like this at a local nursery. I am really fond of the Portland Nursery Veggie Calendar & I use it constantly. 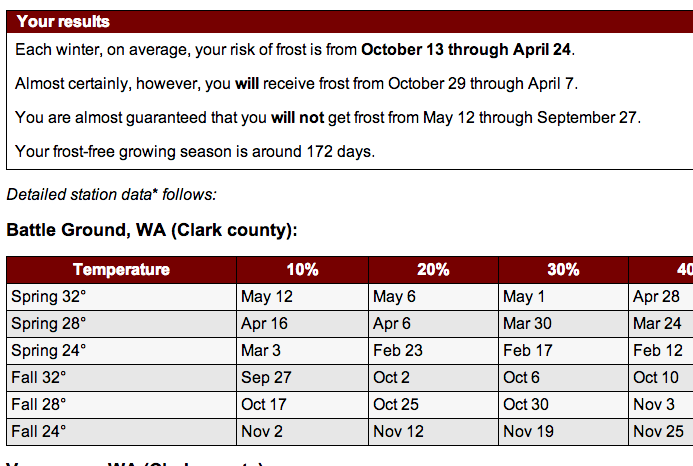 Knowing your "last frost date" is really important to know because it tells you when your plants are safe from danger of being killed off by dipping air & soil temperatures This tool not only tells you when the average last frost date will be based on your zipcode, but it goes a little more in detail to tell you how far you might be able to push the growing season if you are feeling a little risky and tells you when certain temps are likely to happen so that you can make sure all of your cool and warm crops go in at the right time. When trying to decide which plants or varieties you want to grow, there are a lot of things you need to know: how big will they get? are they very productive? is it right for my climate? what kind of soil or sun does it need? 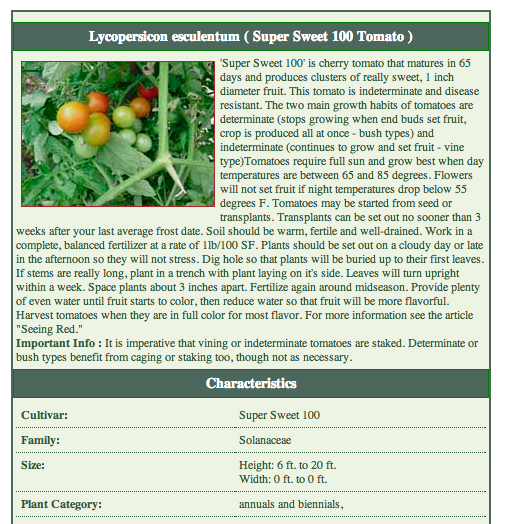 All of these questions can be answered in one place - the mygarden plant encyclopedia. I really love that this houses so much information in one place so that I am no longer digging through 7 different guides to get all the details that I need. You can even use the search to just browse the plants that are compatible with your unique situation by setting the soil type, light time, heat, or even flower color. This may seem like a lot of work, but the extra time to organize before the season starts just gives me time to be fully in the process of getting dirty & having fun with the garden once it's time to get started and it helps make sure that I will have a better chance of successful healthy plants. What kind of tools or planning are you doing for your garden this year?